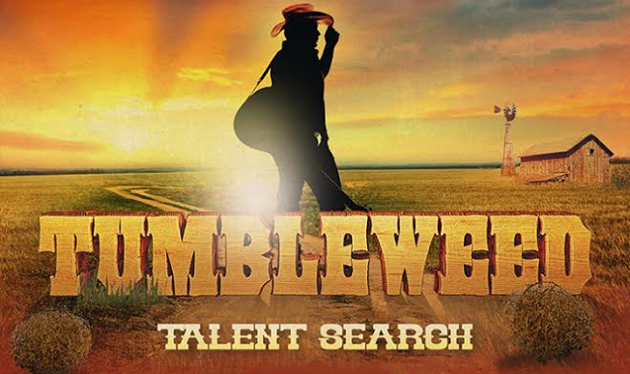 The Tumbleweed Festival, which is set to transpire in Sugar Creek, MO, just outside of Kansas City on July 28th and 29th, has just launched the always dicey proposition of an online poll to see what band will fill the festival’s final slot for their 2nd season beside headliners such as Jamey Johnson, Cody Jinks, Whitey Morgan, and Billy Joe Shaver. Pound for pound, Tumbleweed might have the best true country lineup for all of 2017, and has folks from all around the country planning to trek it to Missouri come late July. Though there are a few false positives in the poll, like Cody Jinks and Mickey Lamantia receiving hundreds of votes even though they’re already in the lineup, and folks not taking the instructions of voting for emerging regional Outlaw-style bands to heart and nominating folks like Willie Nelson, Sturgill Simpson, and Hank 3, surprisingly the top of the poll actually has some really good names, and digging through it is a good way to see who really is emerging in that side of the country music world. Evan Webb, who currently is sitting 2nd in the poll, won Saving Country Music’s Video of the Year last year, and certainly would be worthy of a performance slot. Justin Wells, who had SCM’s Song of the Year in 2016 is also on the list. So are a bunch of other cool bands, like Porter Union, who is currently in 3rd, and are about to release a self-titled album that’s really good. The Dustin James Clark Band is leading the poll at the moment, with James Scott Bullard, The Piedmont Boys, The Reeves Brothers, and Casper McWade also populating top spots in a pack of nearly 100 entries. Anyway, it’s a cool exercise to see who’s bubbling up in independent, Outlaw country. Of course like with all of these polls, it has just as much to do with the motivation of the artists and their ability to mobilize their fan bases as opposed to a true litmus test of the quality of the music. But in this case, it’s kind of working as both. After the first round of voting ends on June 5th, a 2nd round will commence to find the winner of the final spot. Hopefully all participants are good sports and understand that just the exercise itself is doing a lot to spread the music and name recognition of some worthy artists. 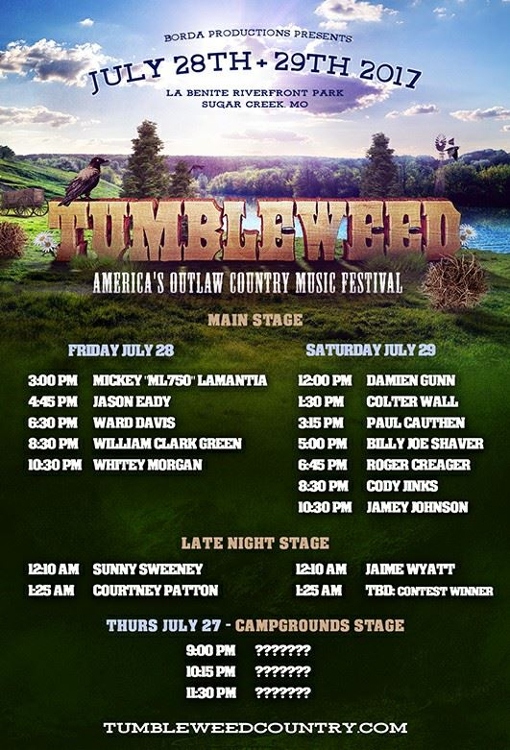 The Tumbleweed Festival also just recently released the schedule for the event (see below). Tickets can be purchased at tumbleweedcountry.com. The Reeves Brothers Were In 6th Place, When You Posted. Show Them A Little Love! The lineup looks amazing, but why are the women all on the late night stage? I asked the Tumbleweed folks the same thing and haven’t gotten a response. I know that the ladies were later additions, but this seems shameful- putting them all on the secondary stage. Yeah, was just so blatantly obvious, curious. One is Jason Eady’s wife Courtney Patton….amazing!! The Reeves Brothers were in 6th place when you posted this, and still are. How ’bout putting their name on the list! The point of this article was to direct people to the poll. Nobody was intentionally left out, or purposely included over anyone else. The names included were simply given as examples. They weren’t part of a list. The list is the poll. If I include the 6th on the list, then the 7th complains they were left out. Include the 7th, the 8th one does. As I said in the article, everyone should see this as a positive exercise, especially seeing how eventually everyone but one band is going to lose. Okay, I’ve added The Reeves Brothers, who I have no beef with at all. And now I’ve opened myself up to a cavalcade of further complaints of who I left of, and why. Deez Nutz is also on the list. Good to see Justin wells in there. Saw Tony Martinez open for Whitey Morgan in Buffalo last year … Absolutely incredible just him and an acoustic guitar I am dying to see him again! On all streaming sites as well. I appreciate all the assholes adding BS names to the poll, filling it up to the 100 name limit, and preventing me from adding Nick Dittmeier and the Sawdusters. Most of them aren’t even funny.